Alpha Dental Practice provides dental implants in Coral Springs – offering you the chance to dramatically improve the way your mouth looks and feels. In our state-of-the-art and tranquil office, you will feel safe and comfortable as we work to create the beautiful smile we know you deserve. A long-term solution that typically last a lifetime, dental implants have substantial functional and aesthetic advantages over removable prosthetic like partial dentures. If we find that you are a suitable candidate for implants, we encourage you to strongly consider the reasons why you would benefit from the procedure. When you lose teeth, the remaining teeth tend to shift and bone loss will often occur. This loss can have an adverse influence on your bite alignment – leading to further periodontal issues and complications. 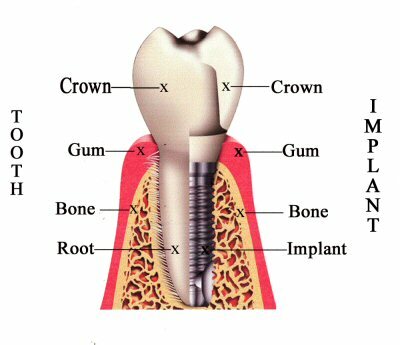 Implants help to preserve the jawbone and correct your bite, restoring the form and function of the mouth. This benefit owes to the fact that implant-supported dentures provide stability. In contrast, dentures typically come with an 80-85% loss of bite force. The team at Alpha Dental Practice makes implants that are carefully designed to match your preexisting teeth, creating an appealingly seamless look. Only an expert would be able to distinguish your real teeth from your false teeth – allowing you to feel happy and confident about how you look when you smile. It is worth noting that patients who move from partial dentures to implant supported dentures often report an improvement in enjoying the taste and texture of their food. At Alpha Dental Practice, Dr. Maya Georges Assi (D.M.D.) and Dr. Tarek Assi (D.M.D.) work together to provide a wide range of cosmetic and family dentistry procedures. We have ten years of dental implant experience which is used to benefit our Coral Springs implant dentistry patients. Our office is designed to provide a peaceful, comfortable environment where you will be treated with the utmost respect and attention. We always provide one-to-one patient care – allowing us to take time to explain treatment options. We utilize helpful educational videos to ensure that you understand any procedures you elect to undergo. If you are looking for dental implants in Coral Springs, contact us today by calling our office or using our appointment request form. We provide appointment flexibility to accommodate your work and family commitments. We are open six days a week including opening as early as 8 am on Mondays, and stay open until 7 pm on Tuesdays. We also provide a Saturday service between 9 am and 2 pm on alternate weeks.